Good morning from Hamburg and welcome to our last FX Report of this week. The AUD climbed against its most major counterparts and the government spoke about a faster recovery from the financial crisis as expected. We wish you much success and have a nice weekend. The USD headed for a weekly loss versus the EUR and reached 1.4877 before a U.S. government report forecast to show that U.S. employers cut fewer jobs last month. This increases the demand for higher yielding assets. Against the JPY, the EUR traded at 134.82 before a German report forecast that the factory orders rose in September for a seventh month. The USD climbed to 90.62 versus the JPY. This week, the JPY lost 0.6 % against the USD. The AUD rose versus 15 of its 16 major counterparts after the central bank from Australia said that the recovery from the financial crisis is three times faster as a national report predicted in August 2008. In Europe the Central Bank President Jean-Claude Trichet said that they won`t to extend the 12 months loans for commercial banks to support the European recovery as a sign that the banks recovered and have no needs for loans. Also the European Central Bank kept its benchmark rate at 1 %. Since the beginning of October, the AUD has been trading in a bullish trend against the NZD. 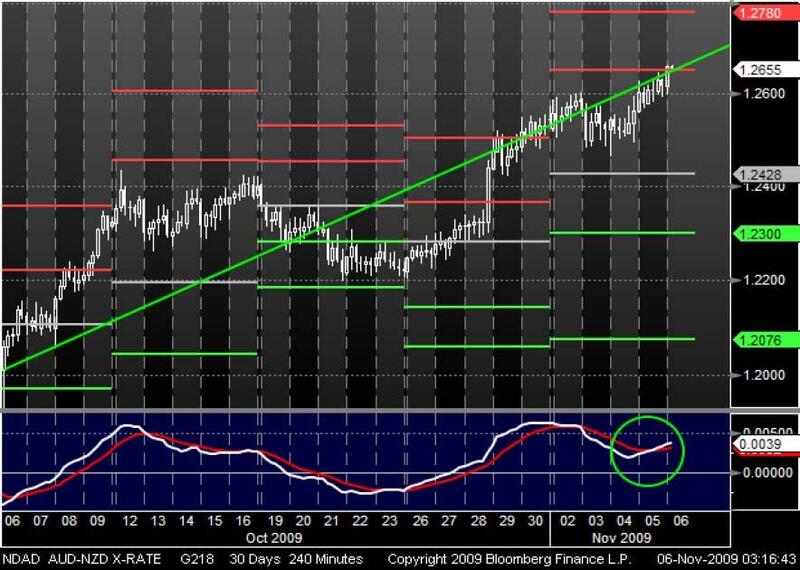 The currency pair tried to cross its Pivot point at 1.2652, but it remains to make sure if the breakthrough is successful like a few days ago. 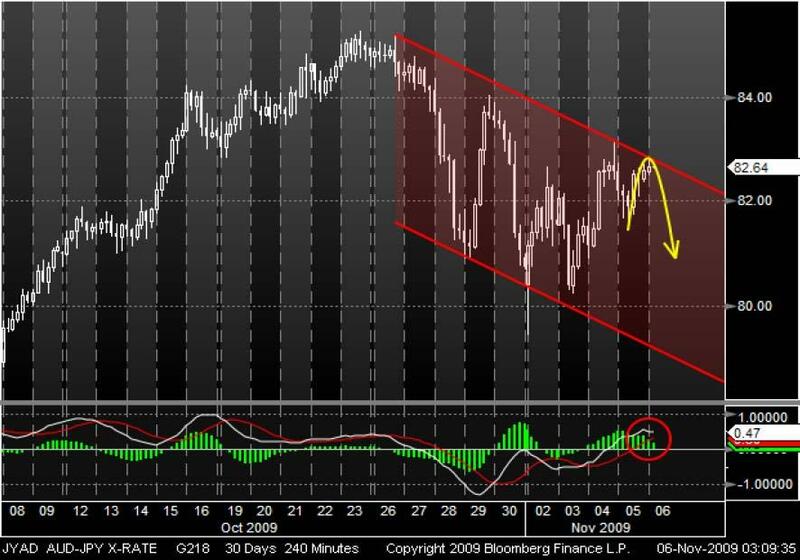 Furthermore a crossing MACD through the signal line from below may indicate that the AUD could continue its bullish trend against the NZD. With the ending of October, the AUD changed its bullish trend and has been trading in a bearish trend channel against the JPY. Every time when the AUD tried to cross the upper trend channel line, the market rebounded, during the last 2 weeks. Also it seems that the MA Oscillator could support the movements with a breakthrough of the signal line from the top.